My Favorite Things Giveaway! - Super Inky! Being an only child, I get a lot of happiness from my toys. 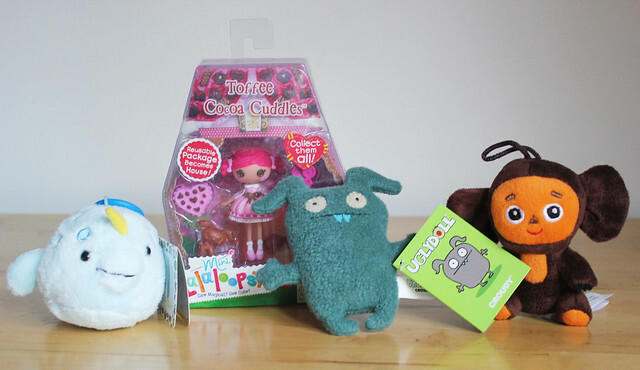 Some of my favorite toys are in this picture- Squishables, Uglydolls, Calico Critters, Cheburashka- I love them all! So, I decided to have a toy giveaway/ photo contest! To enter, just send me a picture of your doll with its favorite toy or accessory! E-mail the photos to inkymarina@gmail.com with a short description of your doll and its favorite thing. If you are under 18, please ask a parent for permission to enter the contest, as I will be requesting the winner's address to mail the prize. The contest entries are due on August 31. I will post the entries and choose a winner by September 3. Without further ado, here are the prizes! I have SO many favorites! How will I ever choose?! Maybe I'll just have to take a picture with them ALL, as you've done! I sent you an email. Thanks for hosting this contest, I think it's great that you want to share some of your extra toys with other people. Guess what, my mom got me the same hair ties that you're wearing in your picture. I haven't used them yet, but I think I will put a side braid in my hair this weekend and use them. Then we can match. OOOH! I want the ugly doll. Better send in my entry fast! Now what stuffy do I like best?? I may enter this contest. And ikny, you like the hunger games? Yay,Inky! This is an awesome contest. So much fun for everyone. Best of luck to all! Hi! I awarded you the Your blog is great award! I love all your toys. I love the awesome prizes too. So will the winner get all or just one of th prizes? I entered! I used my main email though. Hope it doesn't go to spam! LOL!